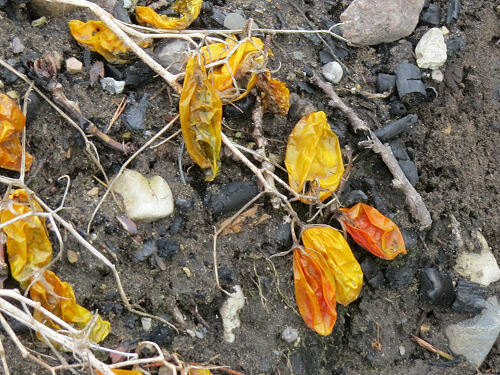 A couple of days ago on a walk I was drawn to a pile of dirt with yellow and orange "things" scattered about. 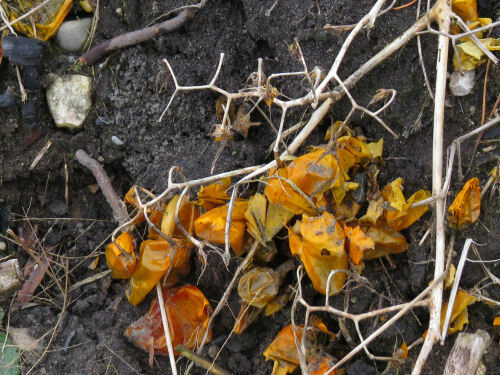 From a distance they sort of looked like rotted yellow tomatoes. I had to go take a look. 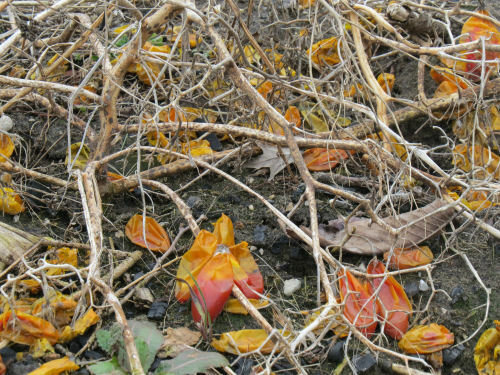 What I found was a plant with ombre red to orange/yellow seed pods. It was obvious that these had been growing along the stalk, in alternate manner. There were seeds in some of the cases. I think I'll take some next time I walk by. They seem to have been thrown away. And if they don't grow for me it won't have cost anything. I'm off for the night of work in a bit. Walking out back today. 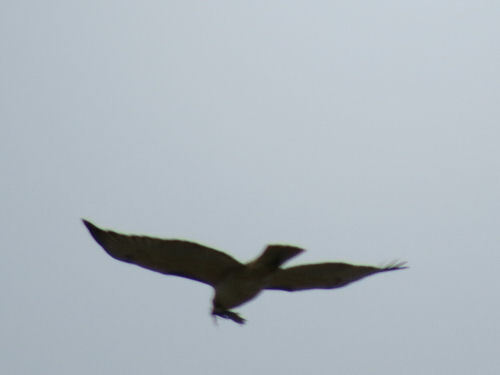 A red-tail hawk overhead with something in its mouth. Not a great picture, but I did manage to at least catch the bird in the frame. Blown up, whatever it's carrying does not look like an animal. And when they hunt, they pick the animal up in their talons. So I think it had to be collecting something to make a nest. 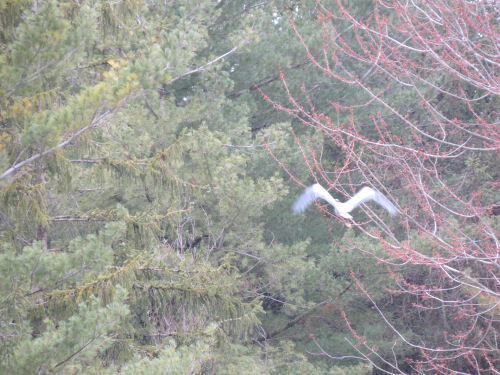 It flew to my hilltop cluster of white pine. It would be neat if it nested there! In other news, Beth has the week off at work. So Terrie had me organize the pallets of inserts to get the five out and ready for tomorrow's paper, and then put the piles that were all over on the shelves, stack the empty pallets, etc. Here's the result. 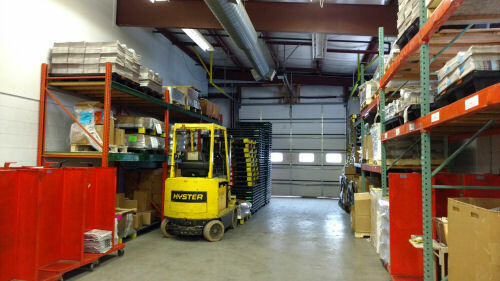 Great chance to practice driving the fork lift. I also had to take it outside onto the road to unload a truck today too. That's as in trails on the Methodist Church property. I doubt that the trails themselves are denominational. Anyway, I had been told there were some trails behind the church that were open to the public. I made time before handbell practice to go check them out. I wandered around until I hit one of them, then followed a loop and two spurs for a total of 1.7 miles. Just a nice stroll. Not much happening in the green department yet, but the sun was shining and the trails were dry. 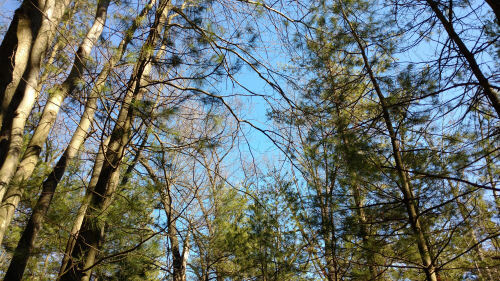 Blue sky and evergreen branches never disappoint. What you can't see in that picture is the large flock of sandhill cranes way up high. I tried to catch a picture, and did get a few of them. You can just see the spots with wings if I zoom in. 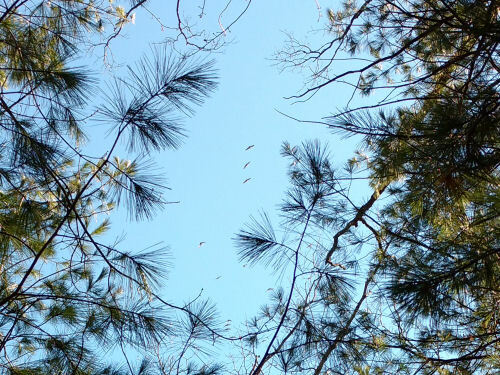 I saw and heard the cranes at the very beginning of my walk. 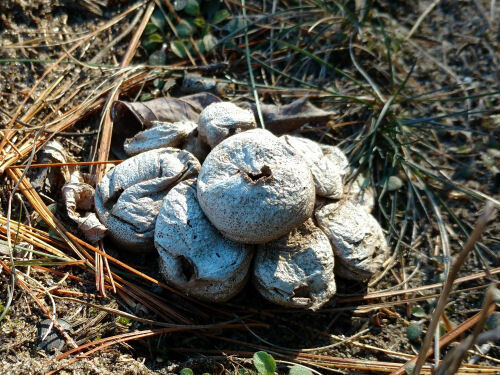 Just at the end I found more of the smooth puffballs that I learned last year. they are all collapsed and have released their spores. The day was gray which does not result in pretty pictures when the world is still gray and brown, but at least I didn't get rained on. 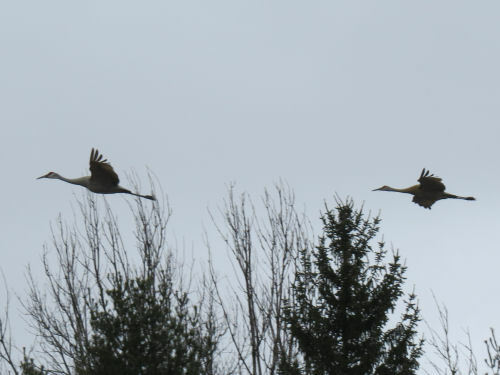 The best sighting was two sandhill cranes. They give me a chance to get the camera on because quite often they call out as they take off. I kind of like this long shot. 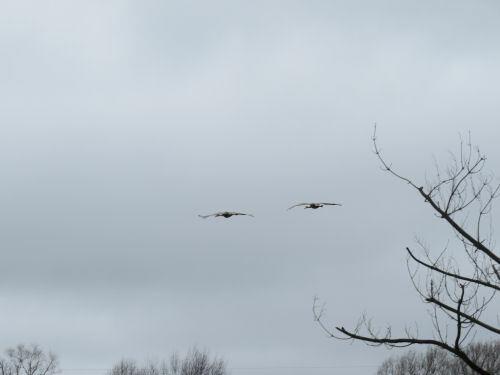 Those big bodies look suspended under the wings as if using a parachute. The great blue heron is usually silent. I was lucky to get the bird in the frame at all. It flew into a pine tree. I took a couple of pictures, but I can't even find it by enlarging the shots! I've taken lots better pictures of both these birds, but this blog isn't all about photography, it's about seizing the gift I am given. Tried to sandwich a walk in between rain events today. Got half a walk in between! The rest of the walk was pretty wet. 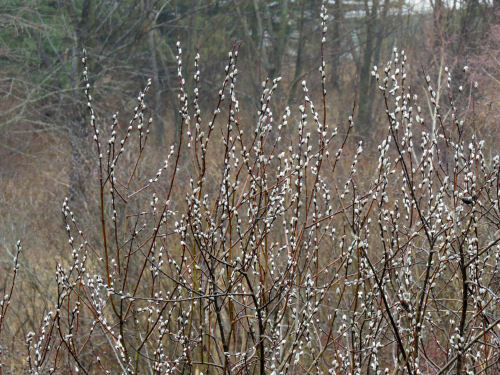 The willow trees are trying hard to look spring-like. Lots of pussies fuzzing the stems. The other kinds of spots were all hanging from branches. I was so mentally focused on the water drops I didn't realize about the spikes till I got home and looked at this picture. I like the contrast of the vicious thorns with the soft droplets. It was so wet the fish were swimming in the road. OK, not really, but it sure looks like one. 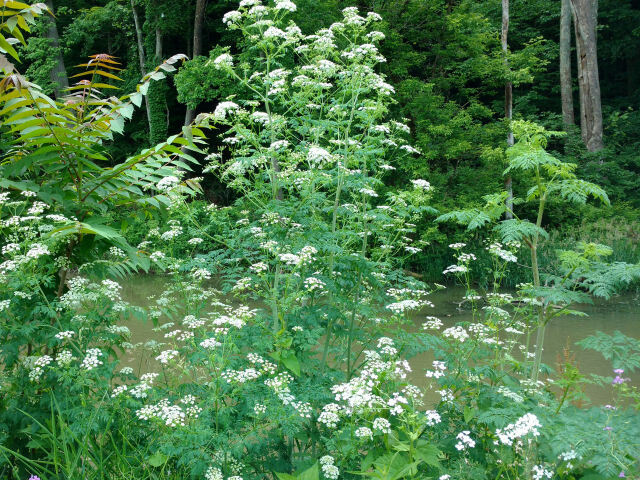 The pictures are a throwback to last summer, but I just finished writing an article about poison hemlock for the North Star. 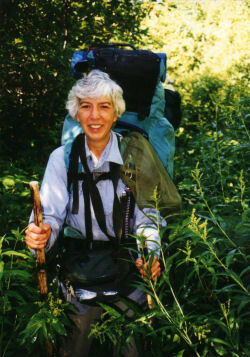 (North Country Trail magazine). It's all I've accomplished today. Last night at work was hard and I slept most of the day. This is a plant you don't want to fool around with. It was used by the ancient Greeks to administer capital punishment... eg. the death of Socrates. 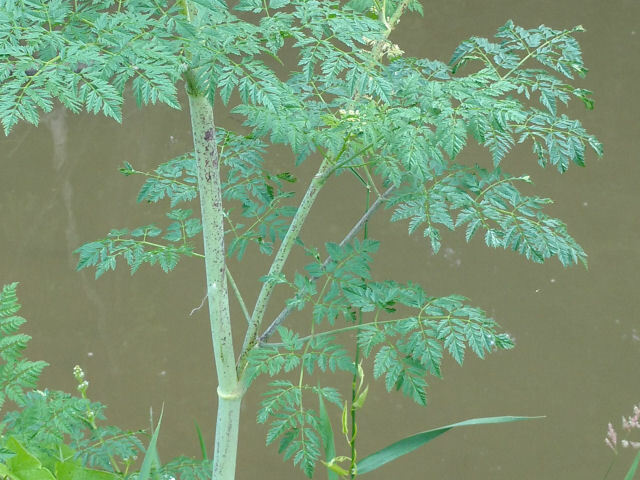 Key features are tall plants with dark green fern-like leaves and a flat cluster of white flowers. The stem is smooth and hollow. It may have purple mottling. Will grow anywhere but prefers moist soil. I blogged about this plant once before, but pictures in different settings and lighting can help us learn to recognize the plant. You're welcome. The critters are becoming a bit more active. Even though spring seems slow, they know it will arrive. On the day I went to Hardy Dam I saw squirrels, turkeys, deer and a grouse. Yesterday there was a herd of robins in the yard. There are birds actually singing at sunrise. That's nice to wake up to. But the only picture I have is a squirrel. Friday and Friday night are the long stretch at work. But I did get a short break this afternoon. Because the paper has not been able to replace the delivery person yet (one guy hired Tuesday afternoon, and he quit Wednesday afternoon), I got to walk a bundle of papers to an apartment complex three blocks away. 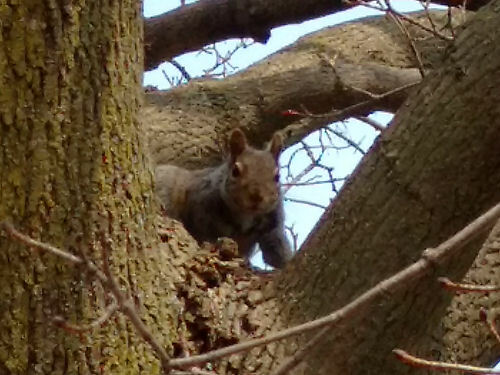 On the way, this little one warily made sure he knew where I was as I passed his tree. The joke is on me. I had a meeting this evening at the Cartier Mansion in Ludington, now a Bed & Breakfast. I thought I was going to get to see the inside of the house. 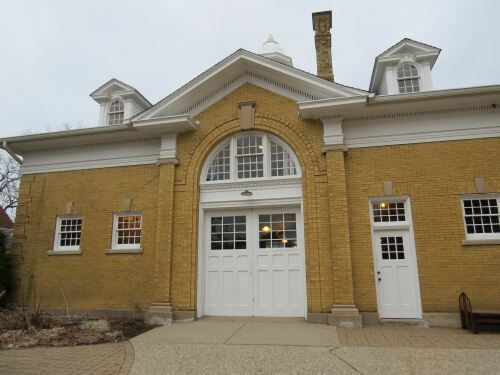 Turns out the meeting room is in the carriage house. 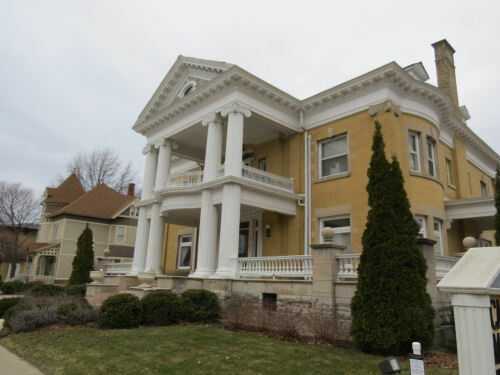 The house was built in the early 1900's by Warren Cartier, son of lumber baron Antoine Cartier. Both men are early legends of Ludington history and politics. From descriptions I've read, many of the high end features of the time period are similar to those at places like Stan Hywet and the Kellogg Mansion. This house is big, but not as big as those, of course. 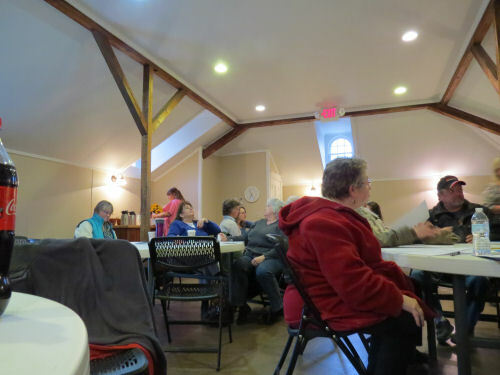 The first floor of the carriage house is now storage. I guess a boat trailer isn't that much different from a carriage. The meeting room is upstairs. Maybe I'll get to go inside another time. 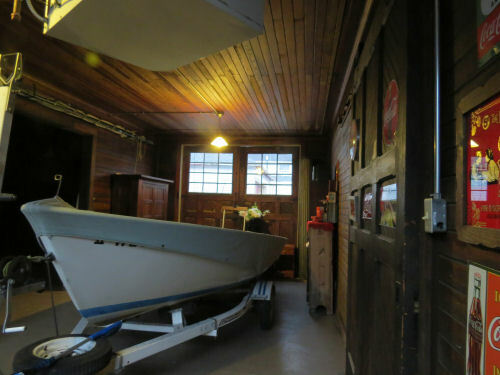 The owners are acquaintances, but does one just go ask for a tour? Link below to an article about the history of the family. I've been trying to be really frugal about driving extra miles near home. Today I had a reason to go to White Cloud (about an hour away) to take some pictures for my upcoming newspaper column. I hadn't realized how much I miss driving around and seeing new roads and places-- you may recall that was the one part of the insurance picture job that I liked. Of course I knew I missed that part, but I was surprised at HOW happy this little trip made me feel. It was a much-needed upper. I smiled and smiled at the sunshine and discovered places. For starters, here's another of the crazy things that intrigue me. Water towers. I like to see what cities put on them, as it's often a statement of what's important to the local culture. The high school team name is "Indians," so I think the painting reflects that rather than the origin of the city's name. 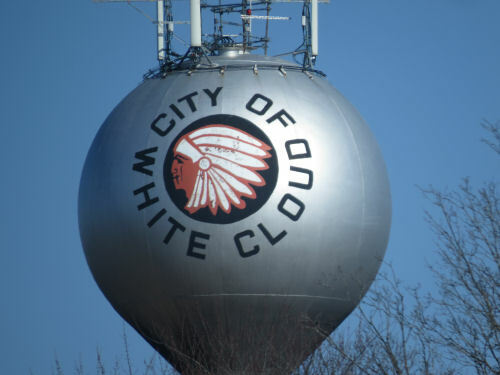 There was a Chief White Cloud, but he was in Minnesota. I couldn't find anything on line about why the city received the name of White Cloud, except that it was first known as Morganville, but the name was changed before 1879. I always assumed it was from being on the White River, but actually don't know. 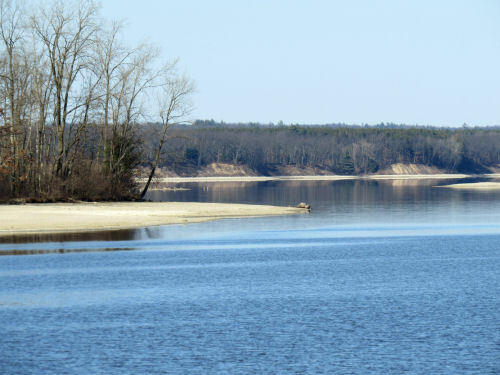 The Hardy Dam is just a bit south of there, on the Muskegon River. It's the largest packed earth dam east of the Mississippi. It's about a mile across, and there is a walkway as well as a road. 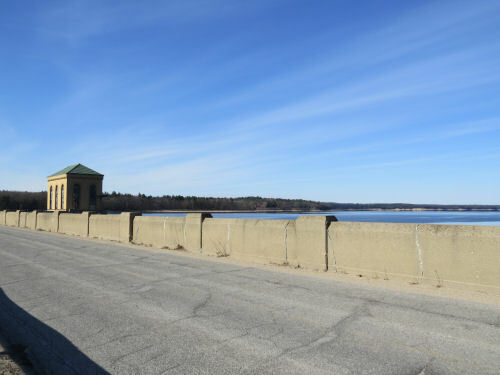 The building is the water intake for the powerhouse which still operates. It's Consumers Energy's largest hydropower facility (according to the sign), and was built in 1931. 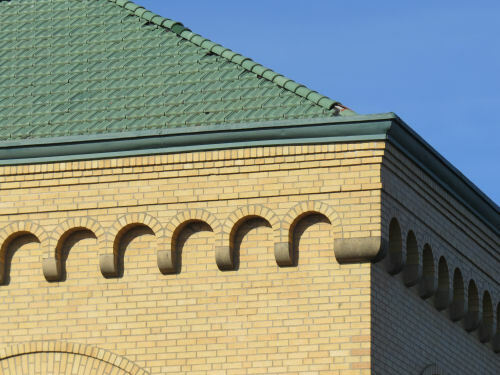 In 1931 they actually cared about making even utilitarian buildings interesting. 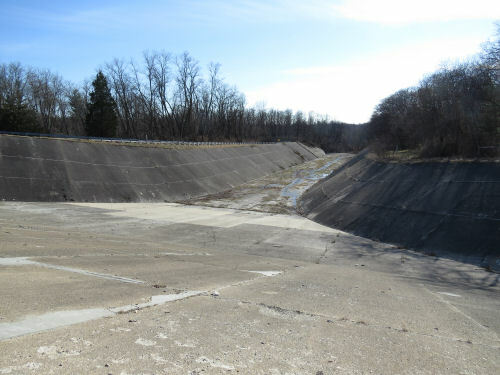 Here is the very impressive spillway. The reason I scrambled to go down there after work was because the sun was shining, and I knew I could get some blue water pictures. 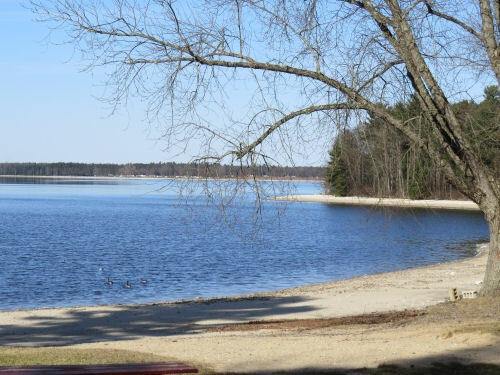 Hardy Dam Pond is about 4000 acres with no development along the shores because the land belongs to Consumers Energy. The water is drawn down for winter- thus the bare edges. 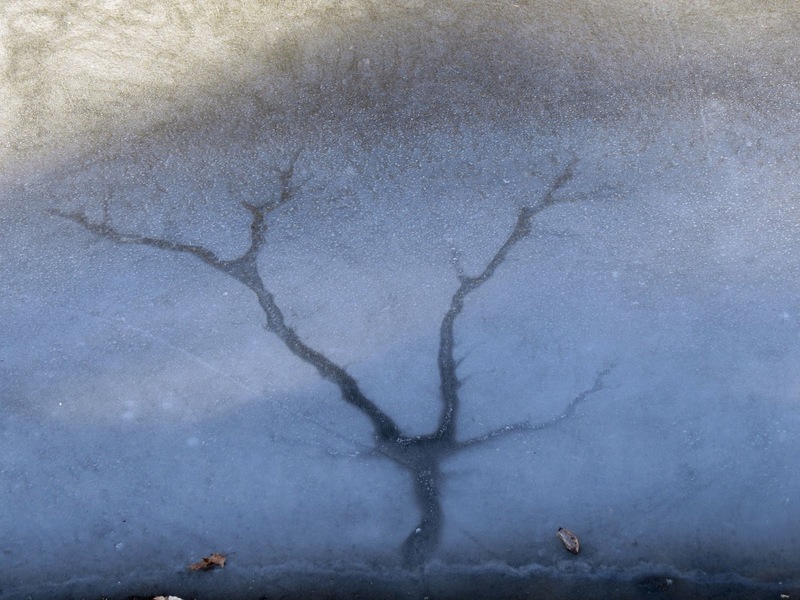 And you know I like the oddball stuff too, like trees in ice. Just a crack actually, but it sure looks like a winter tree. 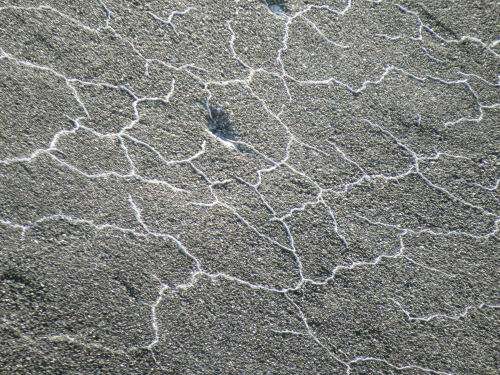 Or how about some cracks in the spillway pavement? Neat pattern. Fractal geometry explains why they are similar. For a final treat, this road got narrower and narrower, and made me smile broader and broader. Of course this piece of road only lasted a mile, but the smile lingers on. Here's where I brag just a little tiny bit. 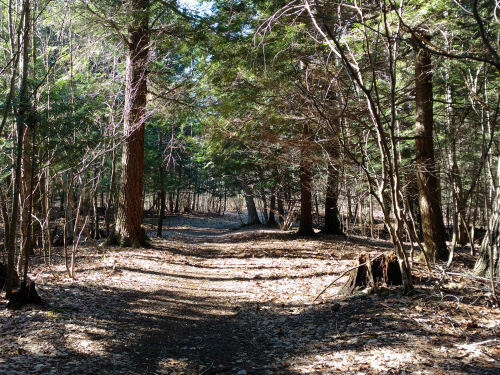 If nothing goes wrong in the next five weeks, I will become the first person to have hiked all of the North Country Trail (New York to North Dakota, plus the Vermont extension), the Finger Lakes Trail (New York, Allegany State Park to the Catskills), and the Buckeye Trail (encircles Ohio). 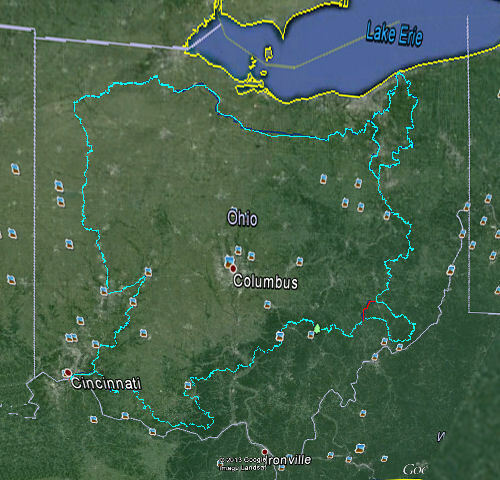 All I have left to do is a little piece of the Buckeye Trail, in red on the map below. Marie and I are hiking those 63 miles at the end of April. I ordered maps. They came on Saturday. 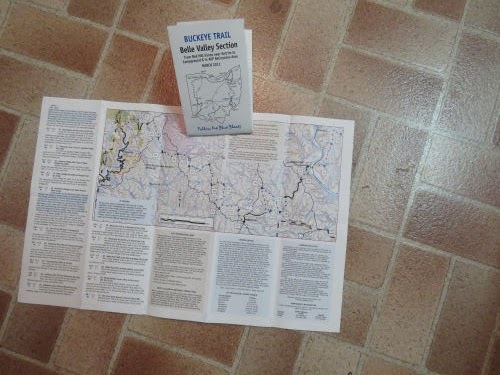 They have a basic map and written point-to-point guide. But I always like to have more info. Definitely maps from more than one source. 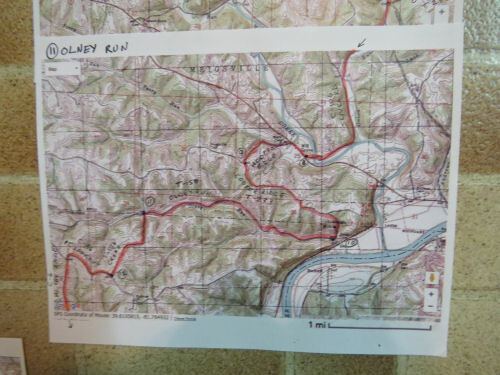 I often print out sections from USGS topo maps and mark the route on them. I did that for this hike because it's going to have a lot of topography. Then, for fun, I like to lay them out connecting the trail line to get a feel for what we are hiking. Never mind the dirty floor. There are more important things to do. Like planning a hike! 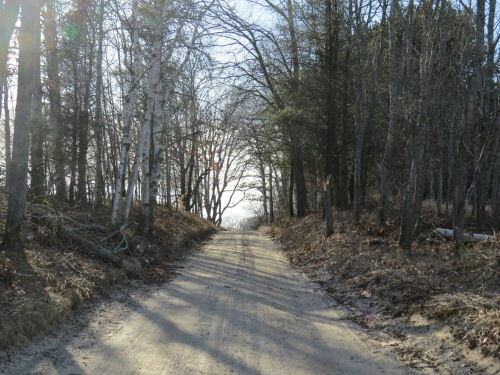 This hike is about half trail and half road, but most of the roads are very rural. These will not be the straight, flat roads of northwest Ohio that I hiked last fall. Can't wait! Let the hike planning commence.